This is our job, folks! The other day, I was reading comments on several forums that had to do with various theological interpretations connected to the End Times. This area is called Eschatology. Eschatology is from the Greek word eschatos meaning last, farthest and then the study of. In essence then, Eschatology is the study of last things as related to the end of this age when Jesus returns and the culmination of all things biblical. According to the rabbinic sages of old, there are simply two ages to this world. The first is the age we currently live in and which began at Creation. This age will continue until the physical return of Jesus. Once He steps down onto this earth in His physical form and sets up His Kingdom where He will reign for 1,000 years, that will be the second age. This is why when Jesus speaks of “this” or “that” age, He is referring to one of these two ages. It is most interesting to see how things have become so convoluted over time. Things were pretty simple back in the days of the Old Testament rabbis and sages. Though they of course did not get everything right, they were pretty much right on with most things. Unfortunately, they could not see certain things like the “gaps” that were built into God’s timeline because of their position on the timeline. However, because of our position looking back and based on additional information from the New Testament, we can see those gaps and know the role they play. For instance, Zechariah 9:9-10 is an interesting passage because it makes it appear as though when the Messiah appears, He would immediately create worldwide peace. Between verses 9 and 10, we notice that there is absolutely no gap in the text. It seems that things are concurrent and that’s generally the way Jewish people saw things based on the passages like Zechariah from the Old Testament and this was even the case during Jesus’ day when He physically walked this earth. But let’s take a look to see what we can see from our perspective. on a young donkey, the foal of a female donkey. and the battle bow will be removed. Then he will announce peace to the nations. Interestingly enough, Zechariah 9:9 seems to be fulfilled in Luke 28:28-40 where we see Jesus riding into Jerusalem on a donkey accompanied by shouts of “Hosanna!” But then verse 10 seems to indicate that peace would be the immediate result of that. However, peace did not occur. We can argue whether or not God expected, wanted, or intended the verses in Zechariah to actually work themselves out concurrently in real-time (and there has been plenty of argumentation regarding this! ), but in truth, there is clearly a “gap” of time between the two verses. Jesus came the first time and rode into Jerusalem in triumph (roughly AD 32), only to be put to death on the cross a few days later. He died and rose again and currently sits at the right hand of the Father in heaven. We can conclude then that verse 10 will find fulfillment when Jesus returns and sets up His Millennial Kingdom. Of course, let’s remember that there are people today who call themselves Amillennialists and do not believe there will be a physical, literal 1,000 year reign of Jesus. They allegorize numerous portions of Scripture, especially Revelation 20 where it speaks of a 1,000 years. However, the Bible has numerous places where a 1,000 year time of peace under the Messiah will exist and like the passage in Revelation, there is no reason to view those passages allegorically. But Amillennialists see Jesus as reigning from heaven now, so to them there is no need for Him to physically reign from His father’s (King David) throne in Jerusalem. It all must be metaphorical to them. These folks fail to understand the rule of ownership. Jesus will reign physically from Jerusalem to prove ownership of this planet, but that’s another article. My point is that there are so many theories, arguments, and debates related to the study of last things that it can make your head spin. Amillennialism is simply one version. There are at least half a dozen others and many shades of each. In fact, the whole area of Eschatology can be downright divisive because of the fact that people will become so staunch in their beliefs that they leave no room for others to have an opinion. It all can quite easily devolve into name-calling. Once Christians start calling other Christians names (like “heretic”), the gloves come off and things worsen. It’s been quite a while since anyone has called me that to my face, but over the years, I’ve certainly had my fair share of it for being someone who believes in the Pre-Tribulation Rapture. I’ve honestly lost count of how many times I’ve been told I’m deceived and if I don’t straighten out, there is a great chance I’ll lose my salvation and end up in hell. It’s impossible to talk with people like that because they firmly believe they have a special, unique calling, one that compels them to call it as they see it all for God’s glory. They also fully believe that God is on their side and has their back. I’ve watched Amillennialists argue with Postmillennialists (and representatives from other groups with still other groups). I’ve seen how heated things can get. I’ve seen how much of it tears down the unity that is supposed to exist among Christians all because people take sides over this “last days” theory or that one. I firmly believe that the one thing Christians need to be focused on is the fact that one day Jesus will return. In fact, I also firmly believe that most of us will have died before that happens. If we are focused on the reality of Jesus’ eventual return (without all the minutiae that goes along with it), how then should that knowledge cause us to live now? Shouldn’t it help us – even compel us – to see others in Christ as just as loved by God Himself? Should we not become more loving? Instead, we use our own peculiar theologies to beat people over the head who deign to disagree with us, don’t we? I find it absolutely fascinating how Satan has created such a war among Christians. He has so many of us so preoccupied with the “last days” that we cannot see the “now days.” We are so last days oriented that we are seriously no earthly good now. Show me a person who understands the Bible perfectly at all points and I’ll show you Jesus. In other words, no one human being can be right on all counts, including me. We all have sin natures. We all have baggage. We all have preconceived notions and ideas about certain things from the Bible. Beyond this, we all have unknown reasons why we hold to specific theological positions as opposed to others. We should not be at war with our brothers and sisters in Christ, yet this is what exists. Not too many years ago I was told very pointedly by a Post-Tribulationist that because I am a Pre-Tribulationist (with respect to the Rapture occuring prior to the 7-year Tribulation; Daniel 9:27), I am guilty of deceiving others and that is due to the fact that I myself am deceived. I was warned that if I do not submit myself to God for “correction,” I would likely end up in hell. This is nothing short of demagoguery and all of it based on a theological position that the person disagreed with and felt he had to do whatever he could to strengthen His position by castigating mine. The individual I’m referring to – and again, this happened several years ago – fully believed he was being “loving” as well. He was warning me for my sake apparently. He was trying to help me see just how “demonic” the doctrine of Pre-Tribulation Rapture was and is. Never mind that his reasoning – such as it was – was so convoluted that it made no sense whatsoever. To him, it did and that’s all that mattered. I was wrong. He was right. I was condemned. I soon learned that people like that often have no formal Bible training at all. They almost pride themselves in that; reveling in it. They believe they have not been “brainwashed” by those “liberal” and “heretical” professors who simply spoon feed people like me whatever they want me to believe. They discount the fact that I have a brain, that I can think critically, and that I also seek God’s understanding of His text. None of that matters though because to them, I’m deceived. Never mind that at least some of the people they read and follow also have formal Bible training but they were apparently not brainwashed because they don’t believe in the PreTribulation Rapture position. Go figure. These people who act like this, with virtually no formal Bible training, pride themselves on being taught only “by the Holy Spirit.” They eschew anyone who does not agree with their position and only read or rely on those with whom they agree. In essence, they are brainwashing themselves by refusing to delve critically into the Bible for clarification, preferring instead to fill their libraries and their heads with only like-minded individuals. I personally have books on the study of the last days written by people who have opinions across the board, not just those with whom I agree theologically. Reading those books makes me a better individual even if I do not subscribe to their way of thinking. Folks, we need to get rid of the acrimony within Christendom. Frankly, I would choose never to preach on the last days again except to note that Jesus is coming back one day and He will reign over all the earth, if that eliminated at least some of the acrimony that exists. The rest of Eschatology is up for grabs even though I have strong views concerning it. If discussing it does not cause me to be more loving to my brothers and sisters in the Lord, then I should not discuss it. End of story. Christians have a mission and an obligation to fulfill that mission. Jesus Himself crafted it for us and it is found in Matthew 28:16-20 and is called “The Great Commission” with good reason. 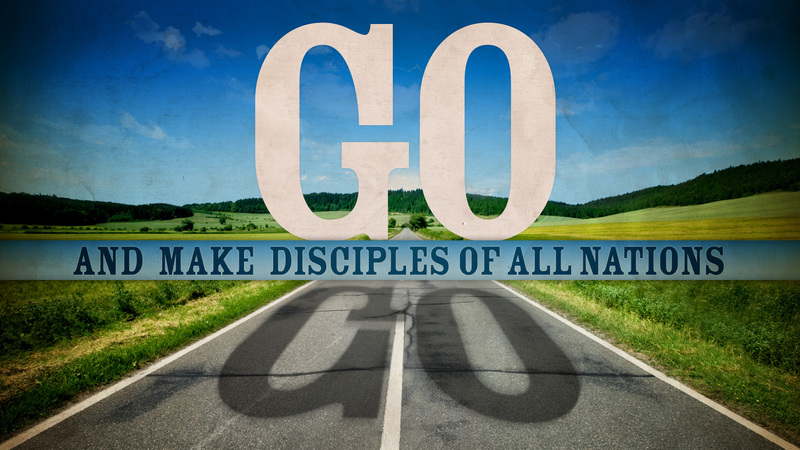 The Christian’s number one job is to evanglize the lost, making disciples of them from every nation. Once they become Christians, the job then is to equip them to go out and do the same. It is not to become entangled in endless debates about this end times theology or that one. The church needs to get back on track. Either we have become too complacent by adopting too many of the world’s standards or we have become so myopic that we cannot see beyond our own pet eschatology. For the sake of unity with the brethren (not the world! ), and to bring glory to God, we must be about His business and His business is clearly detailed for us in The Great Commission. If you’re not involved and you consider yourself a Christian, you’re doing something wrong. Entry filed under: christianity, eternity, israel, Judaism, Posttribulational Rapture, Pretribulational Rapture, rapture, Religious - Christian - End Times, Religious - Christian - Prophecy, Religious - Christian - Theology, salvation, second coming. Tags: amillenialism, eschatology, great commission, last days study, postmillenialism, study of end times, study of last days.